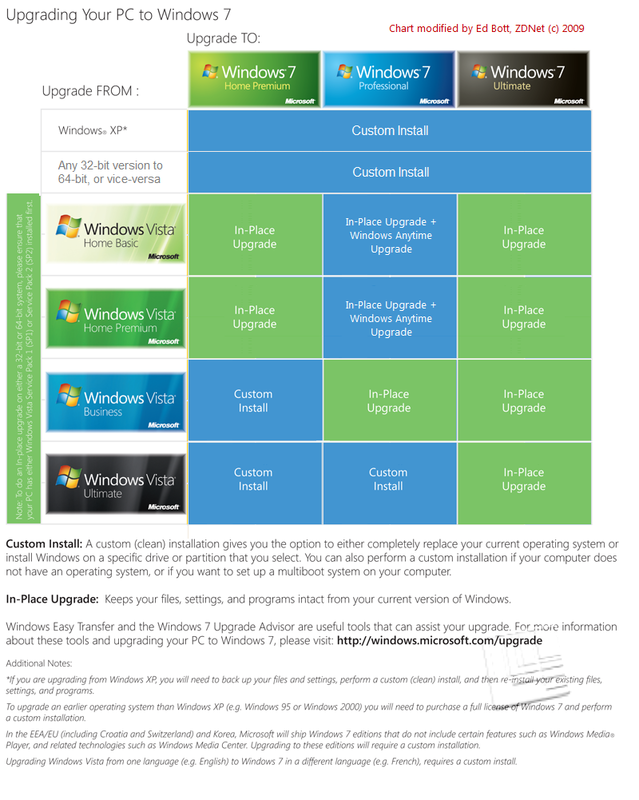 A chart Microsoft provided to a Wall Street Journal columnist that spells out which versions of Windows and XP can be upgraded to Windows 7 without a cumbersome "clean install" is causing a dust-up between bloggers and prompted Apple users to poke fun at Microsoft's upgrade process. The chart, which Microsoft provided to Walt Mossberg, who writes the popular "Personal Technology" column in the Wall Street Journal, consists of a 66-cell matrix that details what XP and Vista users face when upgrading to Microsoft's next operating system. Only 14 of the cells indicate an "in-place" upgrade, one that retains all data and applications, but simply swaps out the OS. Vista Home Premium, for example, can be upgraded in-place only to Windows 7 Home Premium or Windows 7 Ultimate. The remaining 52 cells show where users must do a "custom" install, also often referred to as a "clean" install. That process requires users to back up data and settings, install Windows 7, then restore the data and re-install all applications. Ed Bott, a noted Windows blogger and author, called the chart a public relations mistake -- "Someone at Microsoft is secretly working for Apple," he said in a Thursday post -- but said concerns over the size of the matrix, and the overwhelming number of "custom" cells, is overblown. "Most customers considering an upgrade will be running one of a handful of Windows products," Bott said. "If they are using Windows XP, they'll need to do a custom install to move up to Windows 7. That was announced ages ago. Most Vista users will have clear and logical upgrade paths from their current edition to the same edition of Windows 7." Bott crafted his own version of the chart that reduced the cell count to 14, half of the cells marked as suitable for "in-place" upgrading. Joe Wilcox, a former JupiterResearch analyst and now a blogger and contributor to BetaNews, countered Bott's contention that things are not as bad as the Microsoft chart showed. "Ed uses smoke and mirrors -- a mistake regarding Windows Starter -- to try and discredit the chart," Wilcox argued. "God bless him, Ed spent hours redoing Microsoft's chart to something simpler," Wilcox continued. "It's too simple, ignoring the many real 32-bit and 64-bit combinations that consumers will encounter as they decide on which Windows 7 edition is right for them." Apple fans and users have also waded into the rumpus. Fake Steve Jobs then linked to a page he said represents Apple's upgrade path from Mac OS X 10.4 and 10.5 to the upcoming Mac OS X 10.6, aka Snow Leopard, which is to launch next month. The Cult of Mac blog did one better, aping the Microsoft chart with Apple's version for Snow Leopard. Similar charts have popped up on other Apple-oriented sites. "It's definitely dumb marketing," said Michael Silver, an analyst with Gartner, when asked for his take on the chart Microsoft provided Mossberg. "But you have to realize that the vast, vast majority of Windows 7 will ship pre-installed on new PCs." For those who do upgrade to Windows 7, rather than buy a new PC at some point down the road with the OS pre-installed, the process isn't as onerous as the chart -- and Wilcox -- hint, Silver added. "For the majority of Vista users, they will pop the 32-bit Windows 7 disc in and be done," he said. "And most new PCs shipped to consumers over the past three years shipped with Vista anyway. Really, the biggest issue should be to know if they're running 64-bit, which has shipped on some consumer PCs." And the jabs from the Apple side of the aisle aren't fair, said Silver. "Apple has an entirely different business model," he said. "They don't have a large enterprise market they need to support, and they don't have as much and as big a variety of legacy [applications]. Controlling the hardware and catering to consumers allows them to greatly simplify things. "Windows users will always need to know a bit more about their systems than Mac users," Silver explained. It comes with the broader [Windows] ecosystem and deeper legacy." Microsoft has slated an Oct 22 launch for Windows 7, although developers and IT professionals were allowed to download the final code starting yesterday. Apple, meanwhile, has only promised to deliver Snow Leopard sometime during September. It has not yet nailed down a specific date.